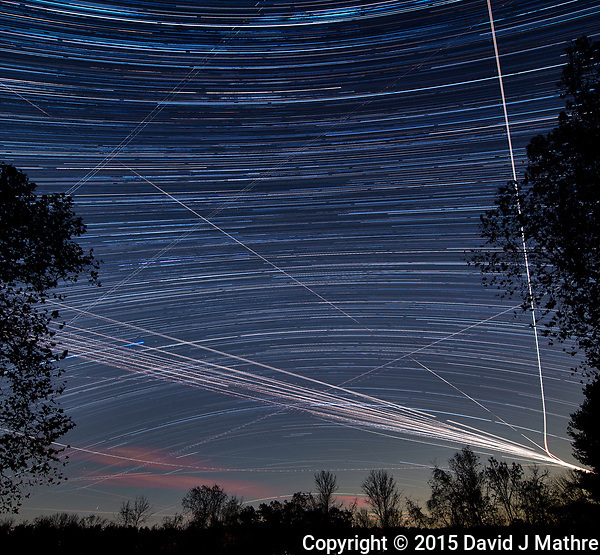 Backyard Autumn Night Sky in New Jersey: Star and Jet Trails Looking South. I decided to do some star & jet trails with a different lens (14-24 mm f/2.8). Unfortunately, I did it in vertical/portrait mode and too much of the top and bottom were cut off by the ceiling and ground so I had to crop the image. Nine years later and still learning best method to do star trails. Also, no meteor trails during this sequence. Clouds moved in as it got toward morning.